This is a tale about greyhound tails, more specifically, about 'happy tail'. Some greyhounds are so happy to finally be free to run for fun that they show their happiness with heavy duty tail-wagging! This furious and frantic tail-wagging can cause injury to the tip of the tail which can then cause significant 'blood splatter', in CSI terms! Controlling tail bleeding can be a challenge. There are good ways to wrap a tail and bad ways to wrap a tail. Your first consideration is that you want to get as much air to the injury as possible and secondly, you want your greyhound to behave and not take off whatever you just applied. This is sometimes your biggest challenge! Luckily, there are a variety of collars that can be put on your dog if it goes after its tail wrap. We now have one called 'Comfy Cone' which will soon be available for sale on our website. It is an Elizabethan collar but much softer than the plastic cones you normally see. It comes in a few different sizes depending on how aggressive your dog is at getting to its wounds. Even if your dog leaves the wrap alone, it is still extremely important to make sure it is secure. To do this, you go approximately three inches above the wound and wrap adhesive around the dog's tail so that it will grab the hair of the tail. This becomes the anchor. Take some bandage and wind it around the tail. 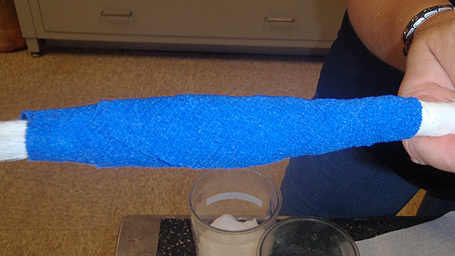 Here is the tricky part; wrap the bandage too loose and all of your work will be for naught with a few whips of the tail, wrap too tight and you will cut off the circulation to the tail and the end of the tail will literally die. If this happens, you will have to amputate a portion of your dog's tail. 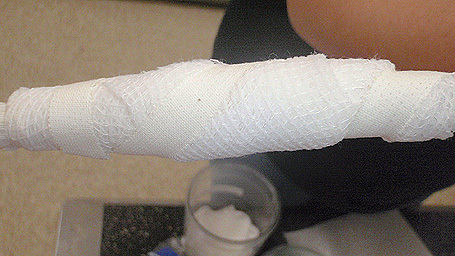 Very often, you want to start with a topical antibiotic covered with gauze, followed by a dressing of non-adhering bandage followed by half-inch adhesive tape, wrapping around diagonally and coming up to the anchor. 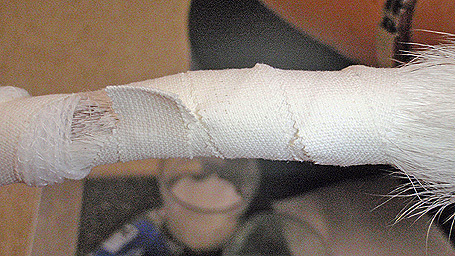 The anchor can stay on even if you change dressings. As the wound begins to heal, the more air you can get to it, the better. Sometimes you can wrap a light covering around the wound along with a hair roller so that air is able to get to it, but it can still have significant protection. Just recently, we probably saw what was the worst tail cut. One of our dogs had gotten its tail caught somewhere and had a significant slice that was 7" or 8" long. We were able to staple it closed. The tail was wrapped and the wrap stayed on for five days before the dog shook the whole thing off intact. We were just ready to inspect the wound to see how it was doing and our greyt friend made it easy for us! Most tail wounds can be healed through perseverance and diligence. If you can't supply that part of the equation, just go for a shorter tail!